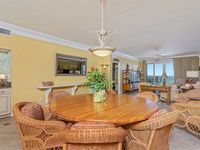 GORGEOUS, TOTALLY RENOVATED CONDO ON BEACH...GREAT VIEWS, WATCH THE WORLD GO BY! Property 1: GORGEOUS, TOTALLY RENOVATED CONDO ON BEACH...GREAT VIEWS, WATCH THE WORLD GO BY! Inn at Crystal Beach 707 - Penthouse - Book your spring getaway! Property 8: Inn at Crystal Beach 707 - Penthouse - Book your spring getaway! In a great condo was the largest table with comfortable chairs I have ever seen. We had a great time but lousy weather. Perfect 7 story building means an uncrowded beach. The COVERED garage was awesome for the bad weather. The courtesy 2 umbrellas and 4 chairs were a deal maker. We were 6 people and had great space. While the showers were a bit aged and could use an upgrade, we'd definitely come again. BTW Condo is for sale. Kudos to John the 'chair man' who worked hard every day to get those chairs and umbrellas out there. A free golf cart would have made it perfect. Thx for everything. This Condo is really nice. Had everything and more to use. View is beautiful. Right on the ocean. Owner is very nice and very helpful.